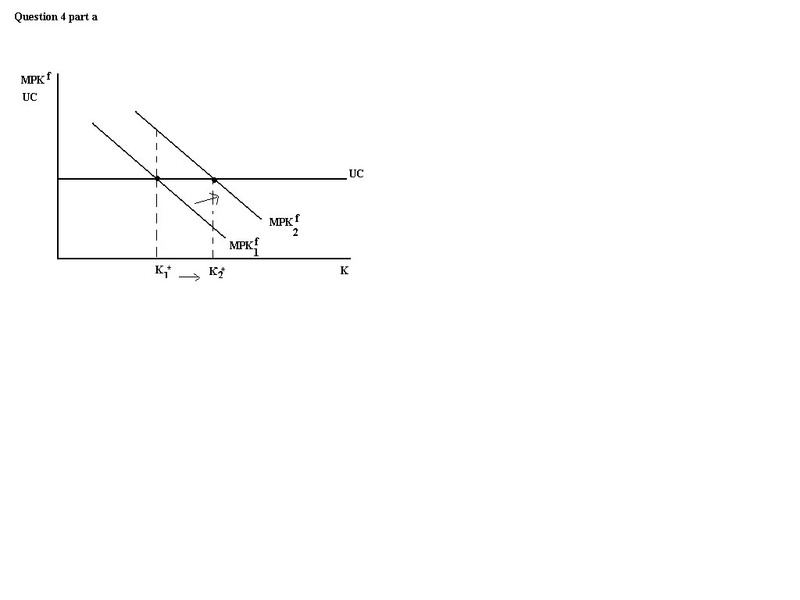 We can see that the production function is homogeneous of degree one because this property is true for any number, i.e. X=2, 3, 100, etc. Q2. MPK is the increase in output from one unit increase in capital. 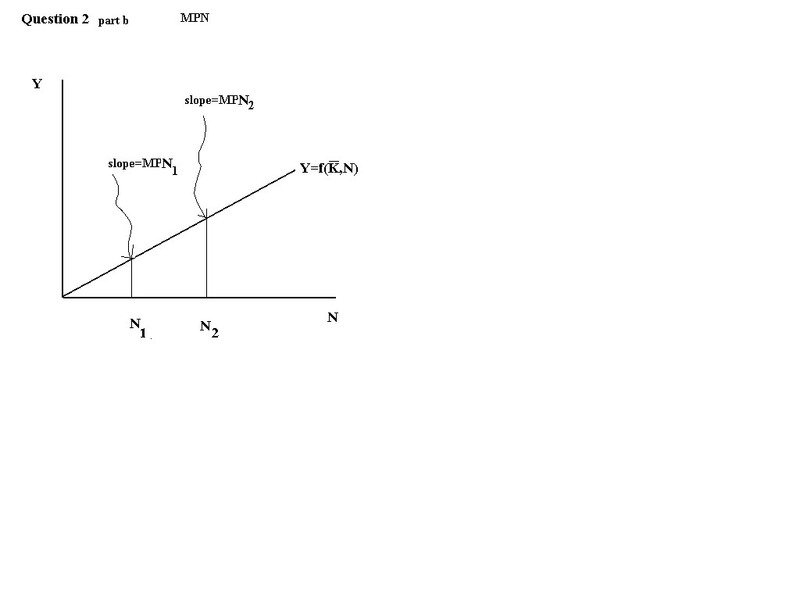 In other words, it is the slope of the line tangent to the production function at any given K. Note: MPK decreases as K increases. 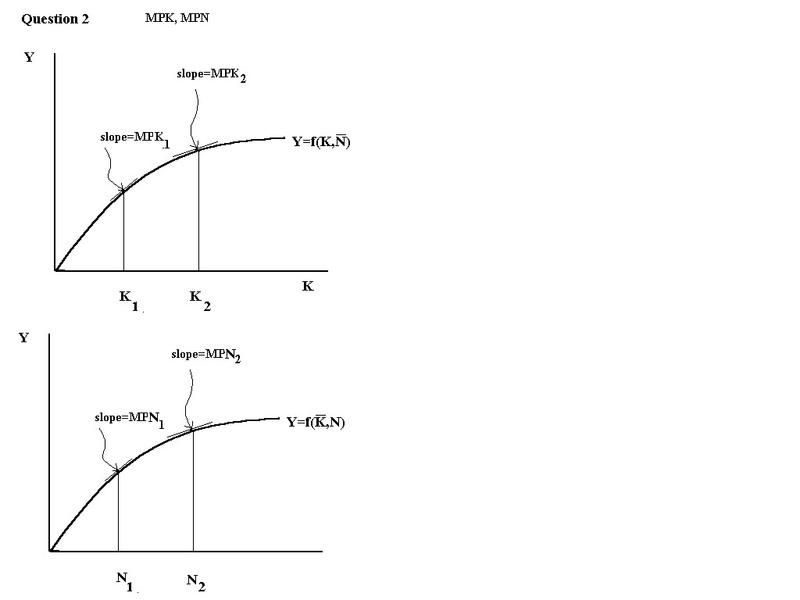 a. Supposing the production function exhibits diminishing returns to scale then two properties of the MPK function are: (1) MPK decreases as K increases, (2) MPK is positive for all K.
(1.5-t) decreases so 150/(1.5-t) increases, in other words, w increases. Also, 2000-150/(1.5-t) decreases, so N decreases. This number is less than 0 for all t.
So we see that an increase in t decreases after tax real wages. So employment will be 1000 and 500 people will be involuntarily unemployed. 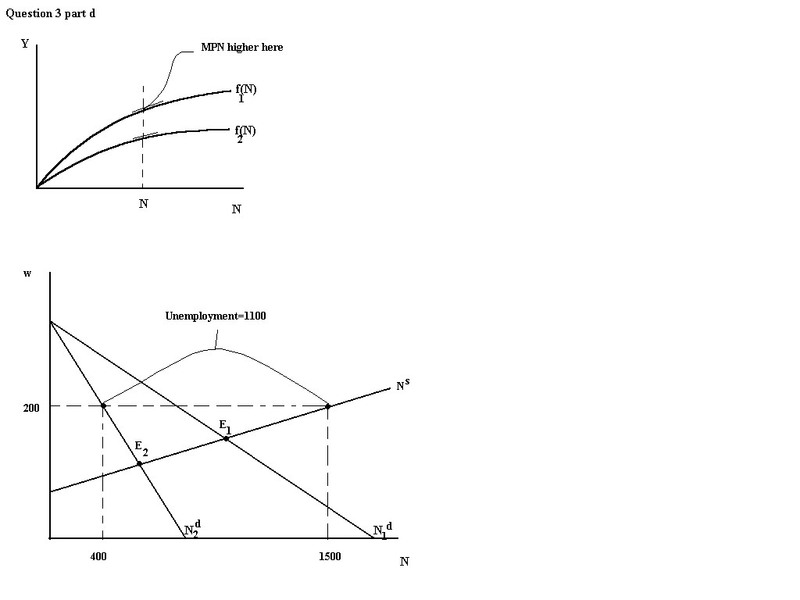 d. If a technological shock changes MPN to 400-0.5N we can see that at any level of N the marginal productivity of labour is lower after this shock. Thus, it is an adverse technological shock. but since Ns=1500 still, we have an increase in involuntary unemployment resulting from the adverse technological shock coupled with a minimum wage. Employment now is 400 and unemployment is 1100.
c. An increase in the real interest rate will increase the user cost of capital. 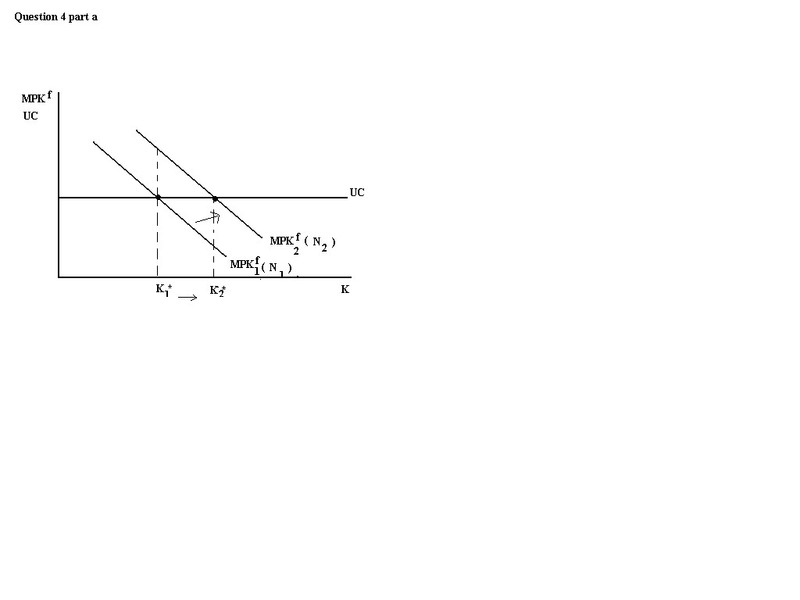 UC=Pk(d+r) where d=depreciation and r=expected real interest rate. Thus, an increase in r means and increase in UC. 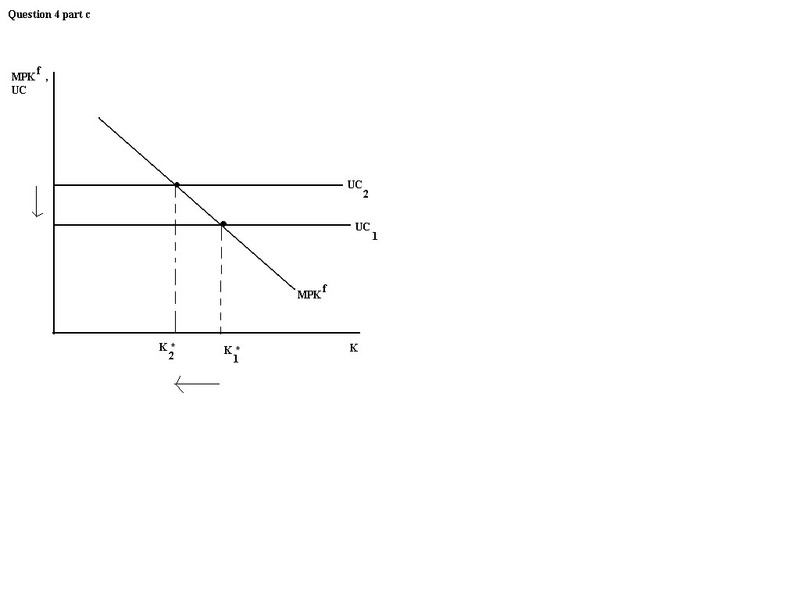 Therefore, an increase in r will decrease the amount of capital stock desired. Note that: Id is downward sloping. 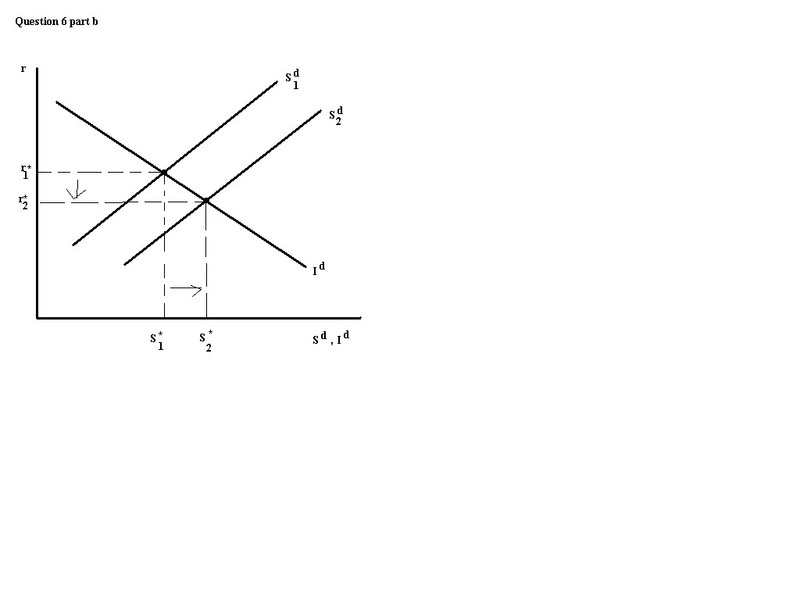 This slope is because as r increases the user cost of capital increases so the desired amount of capital stock decreases and therefore Id decreases. Sd is upward sloping. 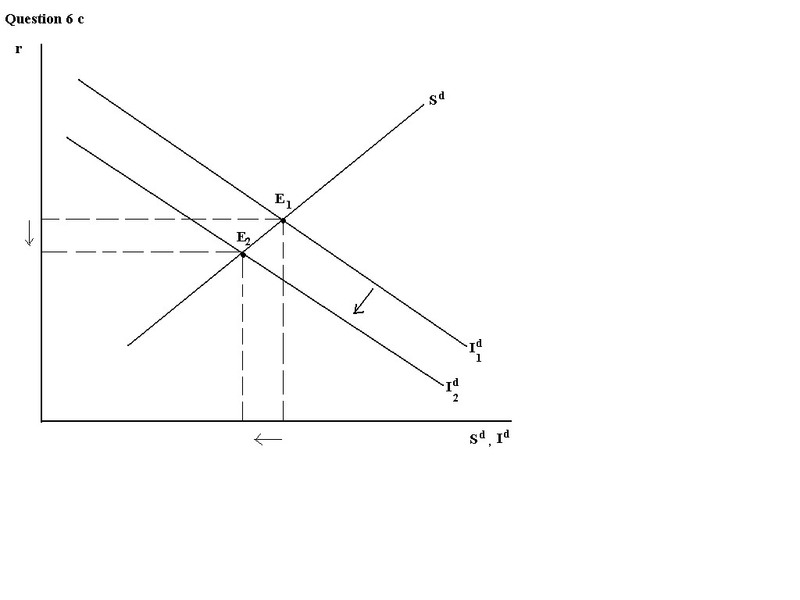 This is because as r increases the rewards to saving increases so people wish to save more (a counter effect is that as r increases you need to save less in order to earn the same amount in the future, but empirically it is shown that this second effect is dominated by the first effect). a. Ricardian equivalence implies that the timing of temporary tax changes doesn't affect desired consumption or desired national savings. Thus, an increase in the income tax rate will not shift Sd, nor will it shift Id, and as such, there will be no change in the goods marked equilibrium from and increased income tax rate. b. A temporary decrease in government spending will cause Sd to shift right. Sd=Y-Cd-G, so for any given r, a decrease in G implies that Sd is higher. 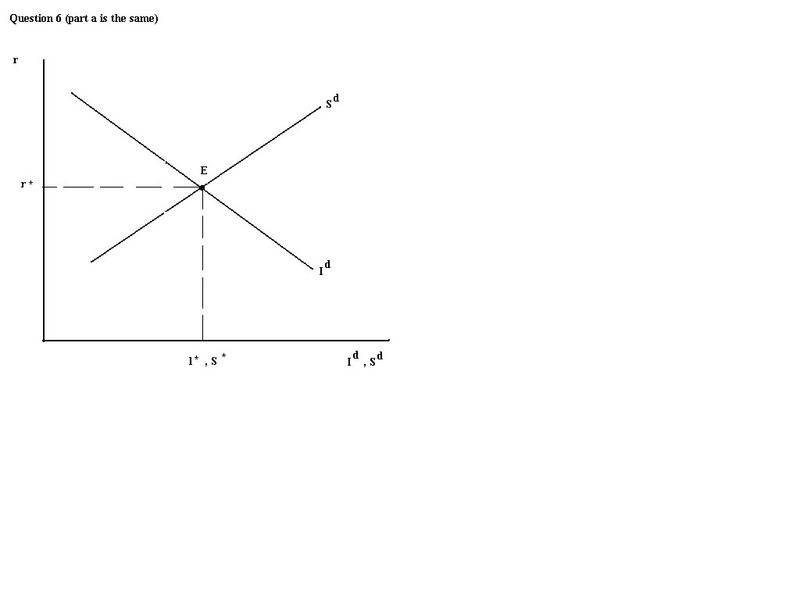 The goods marked equilibrium will shift right and down, yielding a lower equilibrium r and a higher equilibrium Sd,Id. (note: if you see τ in any of the above equations it means that your browser does not support the current code. Wherever you see τ there should be a lower case greek letter tau in its place. 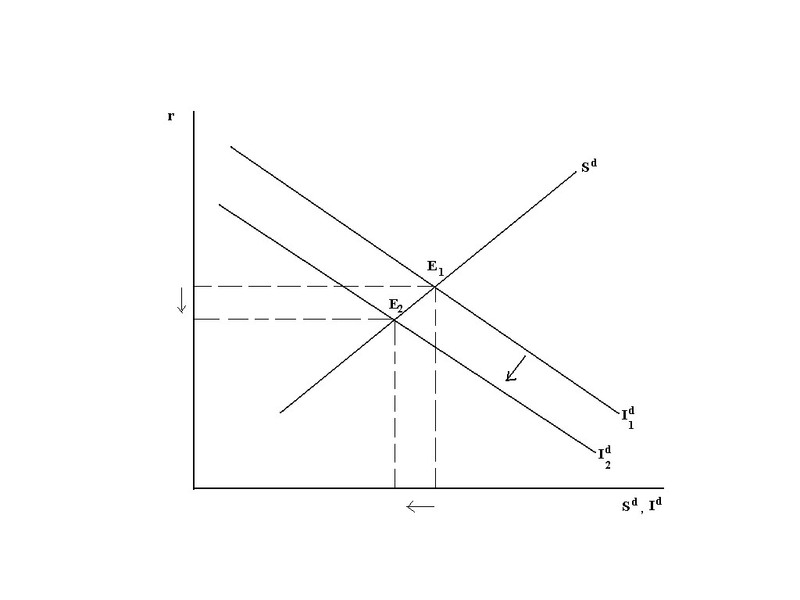 Thus Id is lower for any given r (the Id curve shifts down) and the goods market equilibrium shifts down and to the left. So the new equilibrium r is lower and the new equilibrium Sd, Id are lower.